This 1920s Craftsman bungalow was given new life by Gardner Architects LLC, who renovated and expanded the home while ensuring that it kept its original character and beauty. The square footage of the home was almost doubled, but it still feels nice and homey! 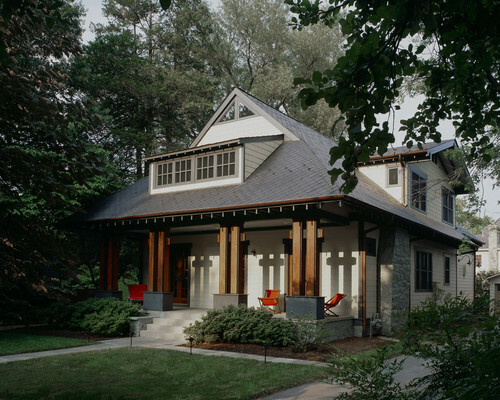 The exterior of the home features a large porch, a long dormer window, and a low-slung shingled roof. The beams on the porch were left unpainted, and small triangular windows at the top of the home bring natural light into the master bedroom. 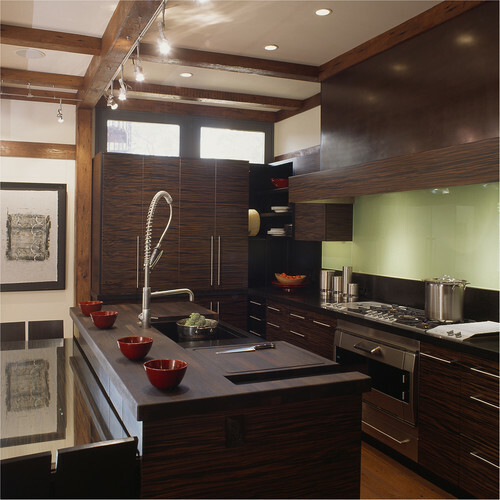 The kitchen is warm and cozy, with dark wood cabinets and black granite countertops. On the left, you can see a small portion of the dining table. It can be tucked away into a niche in the kitchen island! The living room makes the most of the beautiful garden outside the home, with custom-built glass doors. 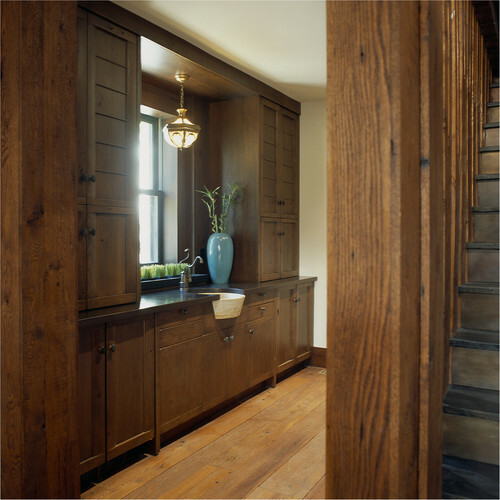 In true Craftsman style, the wood of the beamed ceiling and trim has not been painted. This gorgeous wet bar is tucked away beside the staircase. Walnut cabinets provide plenty of storage space, and a lovely antique light fixture illuminates the work space around the sink. 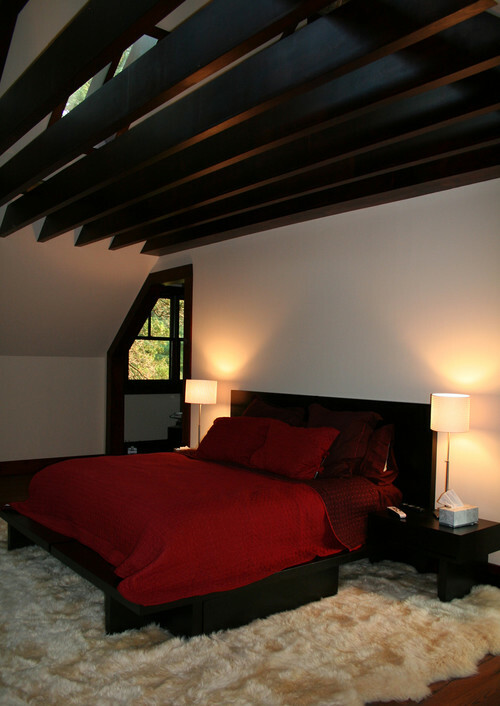 The bedrooms are located on the second floor of the home, and they feature high ceilings and plenty of windows. 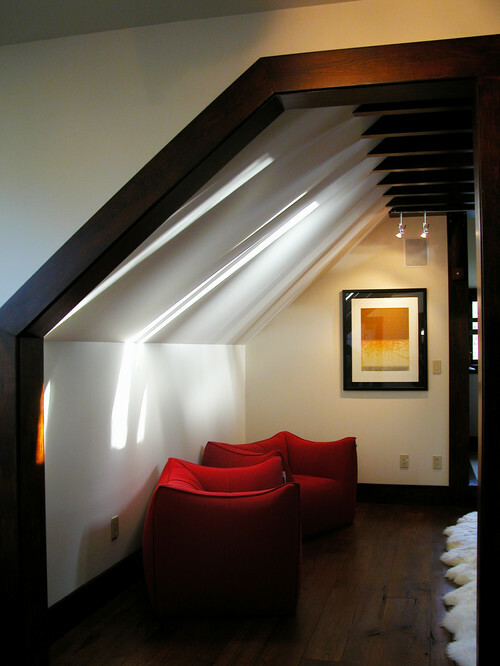 This room has a skylight as well; you can see it behind the exposed beams of the ceiling. The bedroom is large enough to have this little sitting area tucked away in the corner. The contrast of the cream-colored walls and the dark wood trim is just lovely! This second bedroom also has a small sitting area, but it feels lighter and brighter thanks to the white sofa and the paned windows at the far end of the room. The columns that separate the sleeping area from the windowed alcove are truly a work of craftsmanship! This luxurious bathroom is done in a neutral color scheme and contains a large wet room area with two handheld shower heads, a rain shower, and a uniquely shaped bathtub. A large window above the tub brings in plenty of natural light. Last but not least, this screened porch overlooks the beautiful gardens. Wicker furniture and hardwood floors ensure that the space is wonderfully inviting! 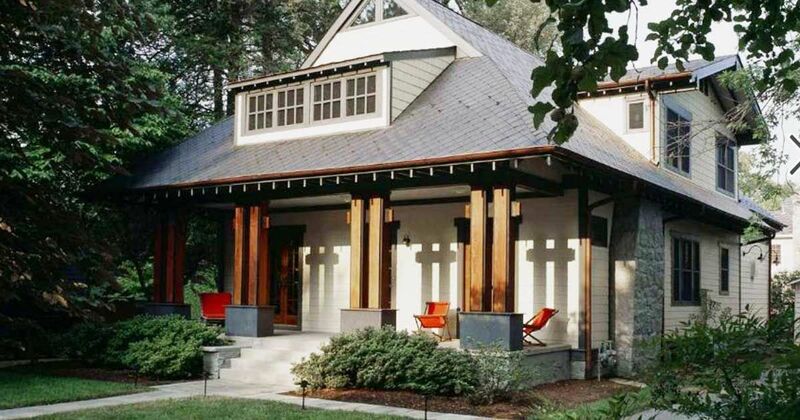 Would you like to live in this gorgeous Craftsman? Head over to the comment section on Facebook to let us know, and be sure to share this article with your friends if you loved it! Coast your way through life with a seashore cottage. This 1950's style home evokes memories of days gone by with the classic columned porch and high roof. The meticulous landscaping creates and environment where the stunning craftsmanship of the house becomes the focal point of the property.. Dating back to 1906, this gorgeous Craftsman is a dream come true for anyone interested in older homes. The house has recently been restored, but it remains an important landmark in its Minneapolis neighborhood! A Dallas-based interior designer renovates an old farmhouse for her young family.